On the day after Montana elected a representative who was arrested for body-slamming a journalist and believes that retirement is inconsistent with biblical teachings because Noah built the ark at age 600, I feel the definite need for some laughter right now or I'll cry my eyes out. 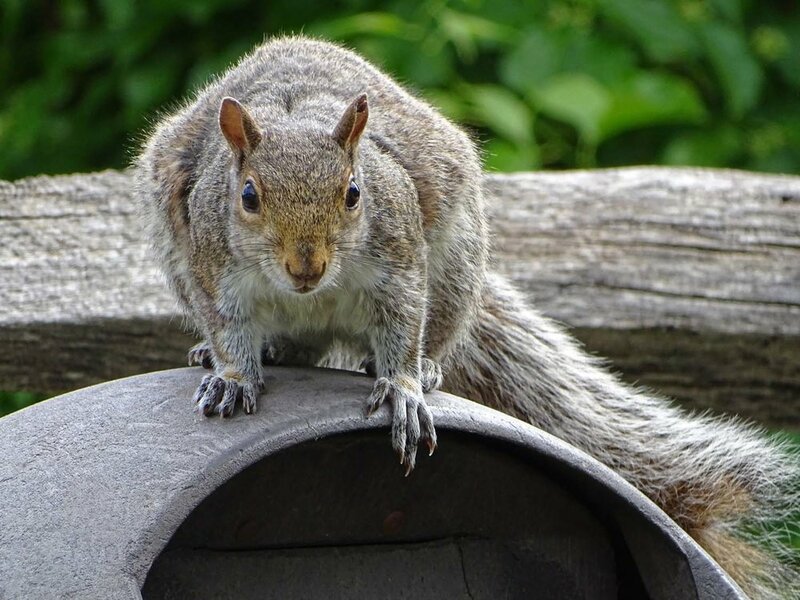 During our trip to Jamaica Bay Wildlife Refuge on Wednesday, we saw this very fat eastern gray squirrel (Sciurus carolinensis) climbing in and out of a trashcan near the picnic tables in front of the visitor center. She made us laugh — there were times she looked very kangaroo-like, and times very rat-like. (I debated whether to call her Roo or Kanga, and settled on Kanga.) She didn't seem to see any reason to stop eating, but then again, she may have been eating for more than one! By the way, my beloved Canon PowerShot SX50 HS broke on Tuesday, and was taken to a repair shop. I bought an open-box Sony DSC-HX400V to get me through the withdrawal, and these video and photos were taken on the Sony. It will take some getting used to (the repair shop couldn't repair my Canon, so the Sony will be my main camera until I pull enough money together to send the SX50 to Canon in the hope my baby can be fixed). I intend to continue to enjoy watching animals like Kanga as they do what smart, creative animals do, and try to stop shaking my head in disbelief at the people who continue to vote for violent, deluded sociopaths to represent them in our government.